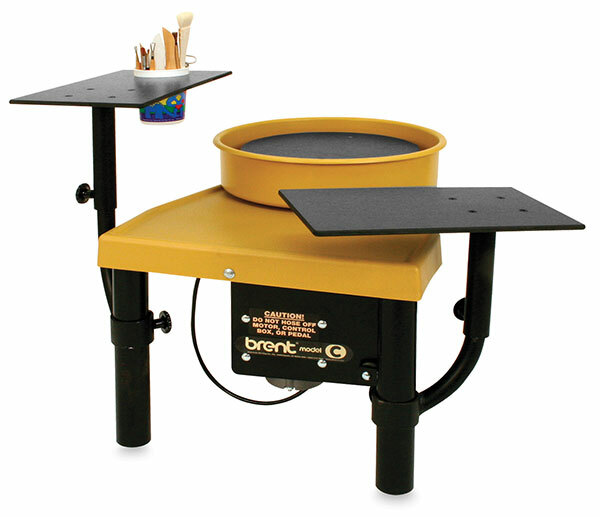 Designed to add versatility and convenience to your Model B, Model C, Model CXC, and Model EX Brent wheels, these Brent worktables also fit Models IE, IE-R, and IE-X manufactured after January 2009. Both Brent WorkTables are 1/3" (8 mm) thick and made from the same rigid, easy-to-clean material as the Plasti-Bat. They attach to the front legs of the wheel with steel supports and knobs and can be adjusted independently. Multiple positions are achieved by loosening one or more of the knobs, then raising, lowering or rotating the table in or out to the desired position, then tightening the knobs to secure. Included with the 18" × 10" (46 cm × 25 cm) WorkTable is a 4¼" (11 cm) diameter storage cup holder. Brent WorkTables are available individually or as a set of two.